There are few games particularly well suited for the iPod's simplistic controls. If there were one all about navigating menus and such, I'm sure it'd do quite well (why *hasn't* there been an RPG yet?). All considered, though, Pole Position hails from a time when you didn't even need buttons to make the car go "vroom!," which means that the iPod's scroll wheel should be the perfect facsimile of a steering wheel, right? It sounds like a good idea until you get your finger on it. Note that real cars feature steering wheels that lock after turning so far and require a hand-over-hand method to operate efficiently. Predictably, the iPod features none of this tactile feedback, meaning that you have to loop your digit round-and-round to even attempt those tight corners. Merely touching the pad makes your car go, so when you need to lift your finger up to momentarily reposition it, you're losing speed; and while the center button allows you to switch gears in manual transmission mode, its unreliability is best not bothered with at all. If Pole Position Remix were a slower racer with gentler curves, the whole scheme might actually work, but then it wouldn't be an effective arcade-style game, either. What's there just leads to too many missed turns and unavoidable crashes. 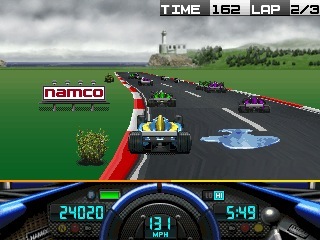 Beyond the expected control difficulties, Pole Position Remix is the same as you remember it, albeit with the typical Namco spitshine. 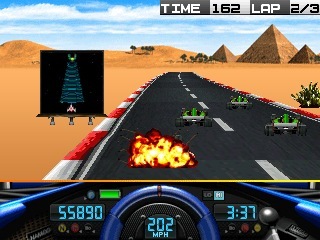 Graphics are reminiscent of a 16-bit upgrade with a pseudo-3D effect and the interface is suitably slick. Playing to the strengths of the iPod as a music player is a good idea and the included tunes (many "remixed" as the game's title implies) sound as if they've been ripped from one of the better Ridge Racer soundtracks. Pole Position Remix isn't going to push the iPod any further into the portable gaming arena already occupied by several more capable machines I'm sure you're already familiar with, but with 15 tracks (well, 5 which are then reversed and mirrored in true Namco fashion) and several themes to unlock, there's enough here to keep you occupied for around five minutes at a time.